A crematorium, a sports field and a multi-storey charging station for driverless cars are among six shortlisted proposals to repurpose decommissioned gasholder sites across the UK. Housing and a battery storage space were also put forward as uses for the circular wells, which are left behind when a gasholder and its latticed steel frame have been demolished. The contest was organised by RIBA Competitions for British gas and electricity network National Grid. It asked architects to develop proposals that could regenerate over 100 of the former industrial sites, dotted across the UK. The six shortlisted teams are: CF Architects, 318 Studio, Max Architects, Wilson Owens Owens Architects, Outpost, and Jan Verhagen and Priscille Rodriguez of Unit Architects. Gasholders are gradually being taken out of use. This is because technology has improved, allowing gas to be stored in the underground mains network, rather than above ground. Verhagen and Rodriguez's proposal sees the wells left behind after the gasholders' dismantling infilled with telescopic cyclindrical blocks, while Max Architects has pitched a housing development surrounding a circular boating pond. 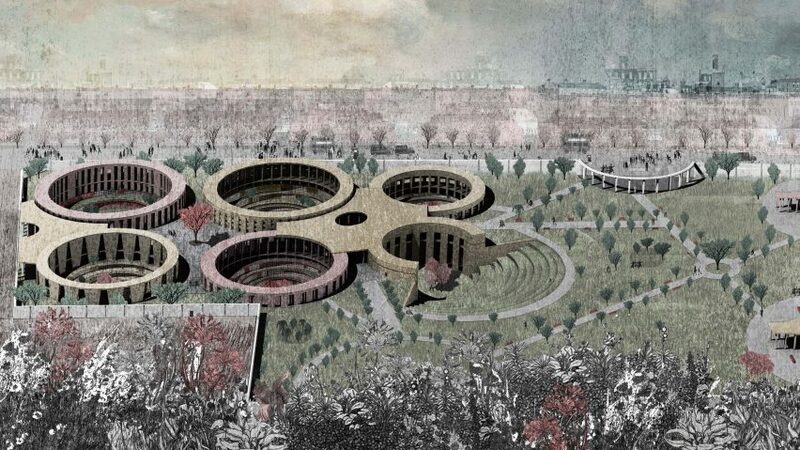 Plans by 318 Studio would convert several of the pits to create a semi-subterranean crematorium, and Outpost would encircle a circular patch of landscaping with a mixed-use development housed in individual gabled blocks. Wilson Owens Owens Architects pitched to convert a pair of the wells into an indoor and outdoor sports centre, with the latter enclosed by tall fencing, echoing the distinctive steel framework of the demolished gasholders. CF Architects looked to the future needs of autonomous electric vehicles for its concept – two spiralling car parks with charging points and drop-off spots for both terrestrial and flying vehicles. Old gasholder sites have also prompted a number of other interesting proposals in recent years. Swiss firm Herzog & de Meuron recently unveiled plans to convert Stockholm's former gasworks into a residential neighbourhood. Meanwhile, the King's Cross redevelopment in London, Bell Philips created a circular park within the frame of an old gasholder. The winner of the Gasholder Bases competition will be announced in December 2017.